I know, strange title. I was going to go with “A Little Self-Doubt Can Knock the Snot Out of Your Portfolio,” but that seemed a bit excessive. 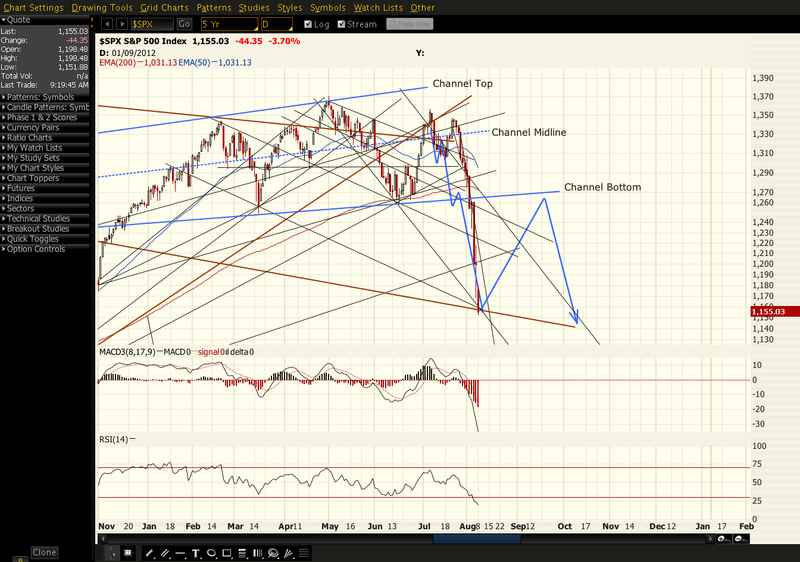 Just came across this chart from June 23 [Deja Vu, All Over Again]. I had recently discovered fan lines, and was pretty excited about the prospects. Combining fan lines with my growing conviction regarding the 2007/2011 similarities, I plotted what I thought might happen over the next several months. Among other things, it convinced me we were going to reverse the 112-point decline we had just experienced, bounce another 50-points to 1328 before falling to 1175 by August 3rd. Then… I pretty much forgot about it. I was frustrated with Prophet and went back to the regular Think or Swim charting format. I last revisited it on July 6, shifting everything forward for the extra time the bounce took. This meant moving a little further down the trend line, so the target shifted to 1156 by August 10th. Then I forgot about it again… until now. Here it is, with the last month of actual results shown. The thing that jumps out at me is the importance of taking a longer view and sticking with a plan. I had no way of knowing (on June 23 or July 6) exactly what troubles lay ahead for the Euro-zone. I had no clue we’d get the employment or GDP figures we did, or that S&P; would downgrade US paper. I wish I could say I didn’t second guess myself every step of the way — trying to outmaneuver the markets, wasting time, commission dollars and profits in the process. But, I did. I ignored my own well-reasoned advice and forecast and traded the crap out of my portfolio. I got nervous when the bounce didn’t go according to plan (thanks to the strategic petroleum reserve release). I got nervous again, when we bounced higher than my 1328 target. And, I got nervous yet again when we barely bounced last week on the way to the current levels. They say never look back; but, seriously, what do they know? $100,000 would have purchased 1,162 SPY July 133 calls back on Jun 23 at .86. That investment would have grown to $214,970 on July 6. That amount, invested in Aug 116 puts at .19 would have purchased 11,314 contracts. Those puts traded today at 3.95. Uh-huh. As in 11,314 X $395 = $4,469,030. Don’t know about you, but an extra $4.5 million would come in handy right about now. Am I kicking myself? Like the lady says, “you betcha.” I’ve done very well these past few months but, unfortunately, it wasn’t a 44X return. So, back to the title: lessons learned. 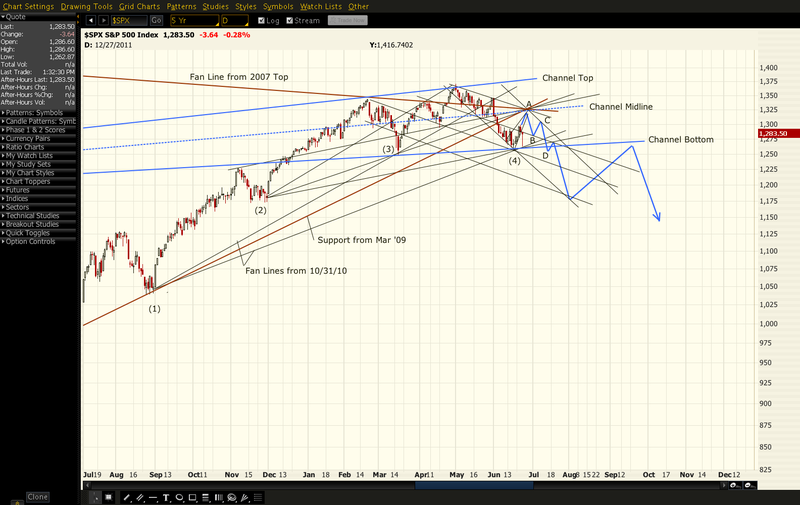 For starters, I’m going to take another long look at the trend lines and 2007 pattern similarities. They’re what brought me to this dance, and I would do well to stop ogling the red-headed research across the room. Next, I’m going to set aside some long-term do-not-break-glass-even-in-case-of-emergency funds, invest them according to my convictions, and leave them the *$%# alone!